AP Suggests Obama has a Donor Problem — What does the Empirical Evidence Have to Say? Tens of thousands of people who together gave millions of dollars to Barack Obama’s 2008 presidential campaign have gone missing this time around. Their failure to give so far may signal that some of the president’s earliest supporters have lost enthusiasm. Q (me): Is it correct to conclude, as the AP report noted, that “larger donations are the strongest signs of enthusiasm“? A (Bonica): I don’t think this is really the case. Large contributions signal more about how much time and effort Obama is putting into big-ticket fundraising events. If someone can afford to drop thousands of dollars per plate at one of these events, I presume they would wait until Obama visits their area before writing a check. If they give the maximum amount over the internet, they are technically barred from giving again at the fundraising event. Small donors and midsized donors are arguably a better indicator of enthusiasm, and Obama appears to have done quite well in this respect. A: I’ve run the numbers on where Obama ‘08 donors are giving in 2012. I included the cross-tabs below—the columns are donors to a candidates ‘08 campaign and the rows are the totals/percentages given to 2012 presidential candidates. I count 793 donors that gave to Obama in ‘08 and Romney in ‘12, which represents 2.3 percent of donors who both gave to Obama’s ‘08 campaign and gave to any of the 2012 presidential candidates. But when I perform the same calculations for donors to Romney’s ‘08 campaign, I find that 2.2 percent of his donors gave to Obama this time around. Yet the article didn’t bother to interview any former Romney donors who switched sides. My numbers cover the entire ‘08 campaign, not just April to September 2007, but they suggest that the Obama campaign has fared well in retaining it’s donor base. Q: What’s the overall situation with donors from 2008? A: . It is still early in the fundraising game. The vast majority of donors from 2008 have yet to give to anyone this time time around. 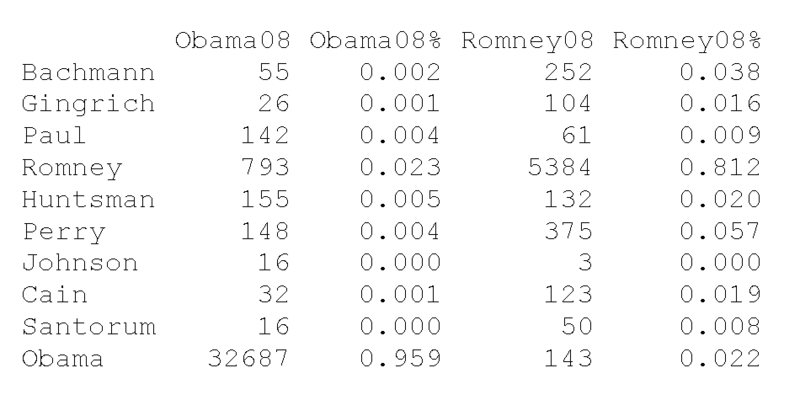 According to my numbers, Romney has only managed to get about 12% of his donors from 2008 to give again in 2012. Another 3% gave to other candidates and the remaining 85% haven’t donated at all. The percentage for Obama is lower (~7 percent), but his 2008 donor base was an order of magnitude larger than Romney’s and many gave during the general election. That being said, given that 43% of Obama’s 2012 donors didn’t give to his 2008 campaign the headline could just as easily been “Obama’s reelection campaign attracts crowds of new donors.” That headline would be just as meaningless since there is no attempt at comparison, but you get the point. Q: Well, if the focus was on Obama’s donor problem, then I assume Romney must be doing better than he did in 2008? A: Romney’s Q3 report lists him as raising $32.5M cycle-to-date, $14M of which was raised last quarter. This is actually less than he raised by this point the last time around. The 2007 Q3 filings had Romney at $44.8M cycle-to-date, $9.7M of which raised in Q3 [of 2007]. Q: Well, if Romney is doing worse now than he did last cycle, then at least he is probably doing better than the main challengers – Clinton and Obama – were doing at this point in 2007, right? A: Here are the numbers as listed in the 2007 Q3 FEC filings. [At the same point in the last electoral cycle,] Obama had raised $79.2 Million. Clinton had raised $80.3 Million. Q: Any final disclaimers for the fine print? 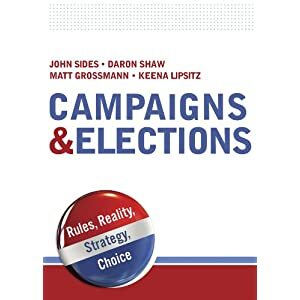 A: Analyses that involve tracking individual donors over time or across campaigns are generally difficult because the FEC does not provide unique identifiers. I’ve spent a lot of time assigning unique IDs for contributors, but my linkage algorithm is designed to guard against false positives, which makes it somewhat conservative. I suspect my numbers on repeat givers might differ somewhat from what the campaigns get using their internal record keeping. 2 Responses to AP Suggests Obama has a Donor Problem — What does the Empirical Evidence Have to Say? I rather contribute my time to a campaign than the few bucks that I could spare. A lot of the people who aren’t donating this time around are Wall Streeters who’s feelings are apparently hurt because Obama has been mean to them. Or something. Having Romney be the number one recipient of Wall Street Money might be a good thing this time around. Meanwhile, Obama’s 3Q number was $70 million, with 98% of that coming in donations under $250. That is very good news in every way.